Interests - Likes make up, nail varnish, colouring, jewellery, baking, stationary, and love the movie Frozen! Sophie woke up on her last day of school with a very bad pain in her chest. She wasn’t able to breathe properly and couldn’t walk very well. We ended up going to our local hospital and they said it was gastroenteritis, but a nurse suddenly wanted to do tests when her sats dropped a lot. The tests later came back saying that Sophie had acute kidney failure and the gene of pancreatitis. 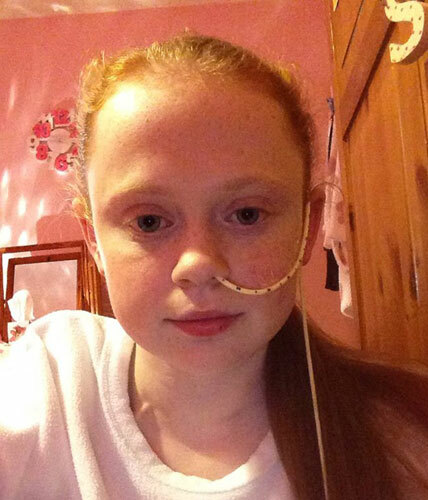 Sophie was in intensive care for nearly 3 weeks on a ventilator fighting for her life. In the end, Sophie fought for her own life and came round and started to hallucinate for days with all the drugs she had been on. Months later we found out that she would have to receive dialysis 3 days a week. Sophie is currently revising for her exams that she missed at school because she was taken ill, she has been very stressed over the past 2 weeks because of this. As Sophie turns 18 in August she is moving to her local adult hospital and is having a appointment with her consultant there very soon. Sophie went to see the kidney man at the Royal Liverpool for a chat and spoke about transplant, about what the risks were and what medication she would be on. Sophie has been feeling under the weather these past few days with her stomach. Hopefully it isn’t anything serious! She should be having an ultrasound within the next few days. Sophie has been quite stable over the past few months! Treatment is going well and she is looking forward to Christmas! Sophie was supposed to be having a peg fitted so that she can feed through the stomach instead of having a tube through her nose. However, the stomach pain she’s had shows that the vessels in her liver are expanding. As a result, Sophie is not able to have a tube in to her stomach, as there would be a risk of her bleeding in to the stomach and attacking the vessels. Since Sophie had her gallbladder out she has gone down hill. She is being sick once a week which isn’t normal and is having regular ultrasounds. These past two week’s Sophie has been in chronic pain with her back and stomach and is taking regular paracetamol which seems to ease the pain slightly. She had an ultrasound which showed that her liver blood vessels are enlarged and if she is sick with blood she needs rushing into our local A&E. Sophie was admitted into her local hospital with pains in her stomach and was put on IV painkillers (paracetamol and morphine). She had to stay over night and was transferred back to Alder Hey in the early hours of the morning. She had a CT scan to show that she has gallstones! Due to Sophie having pancreas problems and the fact she is now 16, we had to go to the Royal Liverpool for surgery to get her gallbadder and gallstones removed. Luckily, Sophie was only in hospital for a night and her recovery was brilliant!